COLORADO SPRINGS, Colo., Nov. 5, 2018 /Christian Newswire/ -- The American church's giant isn't sleeping, but it's busy playing golf and taking life easy in retirement, according to the man behind a campaign to mobilize an untapped golden-years army. Photo: Long-time financial services entrepreneur Bruce Bruinsma is hosting the Nov. 12-14 Retirement Reformation Roundtable in Colorado Springs, Colo., from which he will launch a movement inspiring and equipping Christians to a more active and fulfilling "final quarter," listening to God's call and in service to others. Having built a successful career and company helping Christians save wisely for retirement, financial services veteran Bruce Bruinsma is now focused on making sure they spend those years well, enriching their own and others' lives. 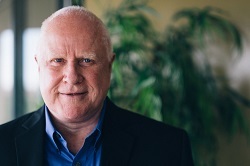 Through his new Retirement Reformation (www.retirementreformation.org) initiative, he plans to birth a movement that inspires and equips seniors to invest their hearts in a deeper relationship with God and their time and money in building God's kingdom. With many believers among America's 50 million or so and growing population of retirement-agers, the church has missed an opportunity to capitalize on their wisdom, experience and resources, Bruinsma contends. "Our career may come to an end, but as Christians our calling to serve God continues until we die," he says. "Imagine what might be accomplished if more older Christians were actively engaged in meaningful ministry. Remember, ministry equates to changed lives." The founder and CEO of Envoy Financial, headquartered in Colorado Springs, Colo., Bruinsma is launching his initiative with a three-day Retirement Reformation Roundtable in the city, Nov. 12-14. An invitation-only group of thought leaders and writers on seniors' issues will meet to share research and ideas intended to fuel the launch of the Retirement Reformation movement. A compilation of white papers prepared specially for the summit will be published soon. There will also be an action guide, A Retirement Reformation Manifesto, outlining how individuals, churches and Christian organizations can be part of the Retirement Reformation effort. It will encourage both pre-retirement and in-retirement Christians to pursue spiritual, emotional, relational, physical and financial health, listen to God's call, and "stay in the game." Many people are completely unprepared for their second half of life, in retirement, Karcher said, though it is the time when "we could most anticipate a greater freedom in our calendars and finances than we prepared for." Welcoming the invitation to be part of the summit, he added: “I anticipate there will be phenomenal new relationships formed, ideas generated, and plans put in place for improving the impact the average Christian has on the world around them." Active in business at 77, Bruinsma was spurred to action after informally surveying many of the clients he had helped prepare financially for their later years and being shocked to learn that, when asked what they intended to do in retirement, 85 percent of them said "nothing," or some version of that couched in terms of "leisure" or self-focused activity. He began researching the issue and found not only an absence of future thinking among maturing people, but also a gaping hole in the church's current view of seniors. Focusing ministry more on young people and families, many churches just tell older members "to keep giving and not be grumpy," he says. The retirement issue has come to the forefront in recent years as longevity has increased, Bruinsma acknowledges. Many people can now expect to live 30 years after they stop working, he says, passing through three different phases of opportunity to be active in God's service as they further age. "This is the first time perhaps since Methuselah that we have had to contemplate the impact of what we might achieve in what the world calls retirement," he says. But the Retirement Reformation isn't only about what seniors can do for the church—it's also about how their lives can be enriched in return. "The world says that it's all downhill after you retire, and you just need to try to enjoy as much leisure as you can before you die," Bruinsma says. "There is something much more fulfilling available; God invites us to be part of reflecting him to the world in every stage of life. Our last quarter could be our best season ever, if we take advantage of a life's worth of knowledge and experience, combined with a greater freedom provided by both time and money."